^ a b c d e f g h i j k l Martin Smith (1991). Burma – Insurgency and the Politics of Ethnicity. London and New Jersey: Zed Books. pp. 90, 54, 56, 57, 58, 59, 60, 65, 69, 66, 68, 62–63, 65, 77, 78, 6. ^ Maung Maung (1962). 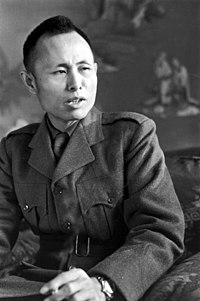 Aung San of Burma. The Hauge: Martinus Nijhoff for Yale University. pp. 22, 23. ^ a b c Aung San Suu Kyi (1984). Aung San of Burma. Edinburgh: Kiscadale 1991. pp. 1, 10, 14, 17, 20, 22, 26, 27, 41, 44. ^ Lintner, Bertil (1990). The Rise and Fall of the Communist Party of Burma. Cornell Southeast Asias Program. ^ Appleton, G. (1947). “Burma Two Years After Liberation”. International Affairs (Royal Institute of International Affairs 1944–) (Blackwell Publishing) 23 (4): 510–521. JSTOR 3016561. ^ Wintle, Justin (2007). Perfect hostage: a life of Aung San Suu Kyi, Burma's prisoner of conscience. Skyhorse Publishing. p. 143. ISBN 978-1-60239-266-3.